As many of you will already know by now, there are major changes afoot here at Steampunk Magazine, and it’s long past the time when we should have said something about what you can expect to see over the next few weeks and months. 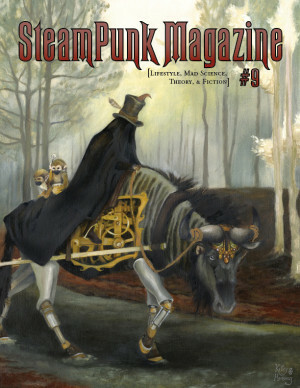 Since Steampunk Magazine began, its base of operations has always been in the United States. The hard work done by Strangers in a Tangled Wilderness to print and distribute the magazine in the US isn’t changing any time soon. However, since Allegra started to help with the editing and publishing of Steampunk Magazine last December, more of the day-to-day running has been done from her base of operations in North Wales in the United Kingdom, where she can bully many of the people that she knows into helping her. At the moment, we are just laying the groundwork with British small-press printers Fallen Angel Media to begin to offer Steampunk Magazine for sale from the UK. Along with this, we have also started work on establishing an international publishing collective called Vagrants Among Ruins, who will soon be joint-publishing the magazine alongside Strangers in a Tangled Wilderness. Vagrants will be organised out of the ranks of those who care very much not just about SPM, but about steampunk as a whole, and will include die-hard supporters of steampunk and Steampunk Magazine both old and new. In the months to come, Vagrants will be expanding to include the publication of books (both fictional and factual), ‘academic’ ezines and articles, and even music, all of which will be Creative Commons licensed and offered for as close to cost-price as we can get it, as well as for free download. Do not be afraid, we will be continuing to put the punk back into steampunk for quite some time yet! None of these changes are going to be bad news for Steampunk Magazine, which will remain the first priority of this new publishing collective. Furthermore, although any new ventures (such as books, music and the like) will be printed and distributed internationally from the UK, those of you in the US will still be able to purchase your copies of Steampunk Magazine locally through Strangers in a Tangled Wilderness alongside the wonderful selection of things both fine and sundry that they continue to create. Unfortunately, all of these changes are going to take time, which means that we have had to push back the provisional release date for issue #7 of the Steampunk Magazine from December 2009 to February/March 2010. This will give us the time we need to set up the Vagrants website (keep your eyes peeled for that one!) and to give the SPM site and Gaslamp Bazaar a sorely-needed facelift. For now, we will be continuing to accept #7 submissions until the end of September, and may possibly open for another wave of submissions in December so that we can ensure that when issue #7 does reach you, it will be the best issue to date! oh, wow! how can I help from Italy? is it possible to contribute to vagrants’ activities? I would like to help as well, I am in Canberra, Australia (that’s the capital). If I can help from Brisbane, Australia, I’d like to as well.